Pure Impulse World (highest package)! original MSRP was $150,095! still under factory warranty. Extended warranty available to purchase from BMW. Amazing Sports Car! Crystal White with BMW i Blue. Almost none available at this price point! Vehicle is on consignment and not stored at the dealership. Vehicle is available by appointment only. Serious inquires only. Financing not available. 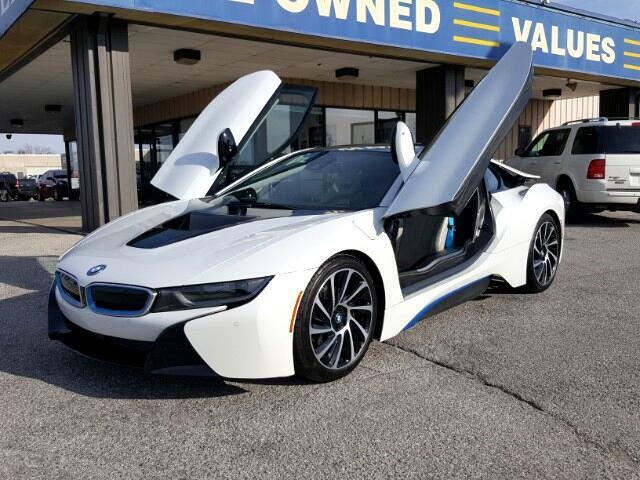 The BWM i8 is a performance hybrid coupe designed to be fuel efficient, luxurious and zippy. Well outfitted in the base model, standard features include: LED daytime running lights, LED tail lamps, 20” premium light alloy wheels, GPS, premium leather seating, remote entry/start, parking sensors in the front and rear, rear parking camera, the iDrive interface with 10.2” touchscreen command console, Bluetooth/iPod/USB integration, HD and satellite radio and an 11-speaker Harmon Kardon audio system. Upgrade the trim and step up to new features that include things like: custom designed wheels, LED headlamps, ivory or black interior schemes and more. Powering this hybrid coupe is a turbocharged three-cylinder gasoline engine that works alongside a battery to get 228 horsepower and 236 pound-feet of torque. BWM offers a four-year/50,000-mile limited warranty.